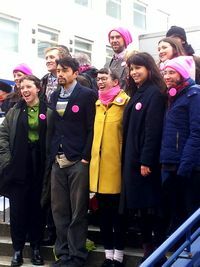 On 28 March 2017 the Stansted 15 took principled, non-violent action to prevent the departure of a Home Office-chartered deportation flight bound for Ghana and Nigeria, through locking-on at the stand where the plane was parked. Originally charged with criminal trespass, this charge was subsequently changed to endangering the safety of an airport, under terrorist legislation. On 10 December 2018 the jury returned a unanimous verdict of guilty. Mid-Essex Quakers are actively supporting the Stansted 15, who have been designated 'human-rights protectors' by Amnesty International. Read our letter of support. Meetings for Worship are held on Sunday mornings, and last for about an hour. Both Maldon and Billericay meetings also hold a mid-week meeting. For location and times of meetings, see Local Quaker Meetings on menu bar. All are welcome to join us for Meeting for Worship at any of these locations. There is no ceremony, and we are not led by a priest or minister. In the stillness we each seek our spiritual truth. Anyone may feel moved to share their insights with the others present. We look forward to meeting you, answering any questions that you may have, and sharing some refreshments after our Meeting for Worship. If you would like to learn more about Quakers, why not find out by sending for a free information pack? or order online at www.quaker.org.uk. It has been validated against xhtml 1.0 Strict and CSS3 standards.